The wall can instill a sense of pride among your staff and clients. It positions your company as a reliable and impressive authority figure in your industry. Newcomers to your organization can learn about your origin story and accomplishments in an engaging, interesting way, instead of reading a dry document or listening to a prepared speech. The timeline can contribute to your overall brand image and your facility’s interior design. The display can even help you land your next business deal as prospective partners get a deeper sense of your organization’s values and roots. However, if the timeline wall looks boring or ‘cookie cutter,’ it can actually detract from your organization’s positive image. This is why our team offers plenty of support through the entire design and fabrication process of your historical legacy display. When a new client contacts us for help with their history timeline, we start by gathering information about the actual space where the display will be located. We always recommend placing a timeline wall in an area which receives high traffic on a regular basis, such as a lobby or open hallway. Additionally, we consider any possible visual or design barriers, such as inconveniently placed wall outlets, fire extinguishers, or handrails, which may impede the fabrication process. Next, we get to know the client’s origin story and brand. We want your history wall to look consistent with the rest of your decor and your marketing style guide, so we will learn about your brand’s color palette, fonts, symbols and icons, and other specifications. We will also talk with you to find out which milestones you want to include in the timeline, as well as images and graphics which can add visual interest to the display, such as historic photographs, charter documents, news publications, and other elements. Once the information gathering stage is complete, our team will create several design mock ups so you can decide on the final design direction for your display. Finally, we will fabricate the seamless wall coverings, dimensional graphics, painted pieces, display cases, and other items needed to complete your historical timeline wall. Do you need professional support creating your history wall design? Give us a call at 312-666-9797 or contact us through our website to get started. 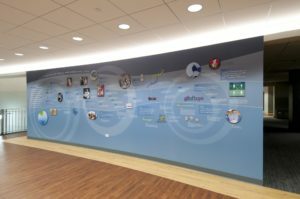 You can also learn more about the design process and see Corporate history/timeline walls – donor walls for schools, institutions and not-for-profits examples of our past work online.